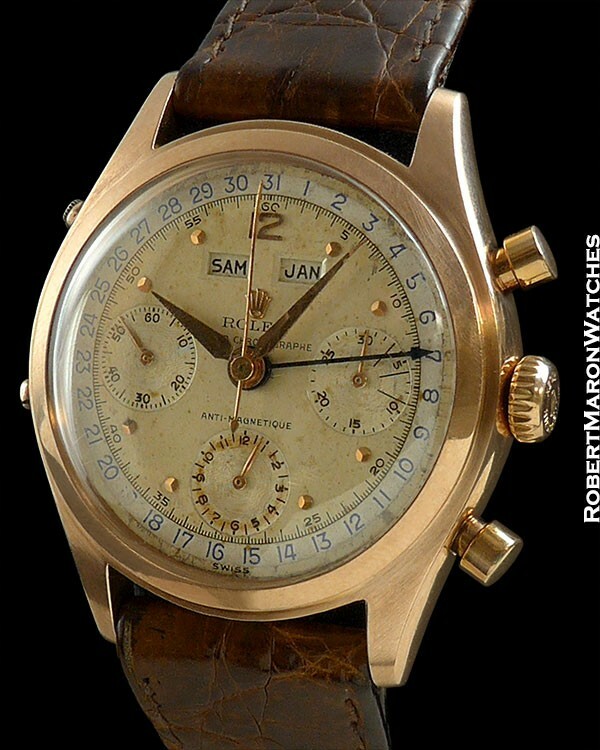 I can’t think of a greater treasure than this watch, if you are a Rolex collector. The triple date chronographs from Rolex are exceedingly rare, invariably reserved for the pages of collectors’ books. While Rolex made these with a few different model numbers, the watches are known collectively as the “Jean-Claude Killy” after the legendary French skier who is both an Olympic legend and Rolex wearer. The Rolex Dato Compax triple date chronograph watches started production in 1947 with the model 4767, followed by model 5036 and then this reference 6036. The 6036 is the most desirable version and this watch in 18k rose gold is astoundingly rare. Rolex only produced around 140 in rose gold, and fewer still with the two-tone silver dial found on this watch. Considering that this watch is accompanied by its original box and papers, even calling it a treasure is an understatement. Original 18k rose gold case with patina is 36mm diameter by 14mm thick, with smooth bezel, domed plastic crystal, original “Rolex Super Oyster” signed crown, pump-style chronograph pushers and screw on case back with ‘6036’ engraved. The case is two-part construction and the watch was called water resistant thanks to its Oyster style case. Serial number 847XXX dates production to 1951. Original untouched two-tone silver dial with applied rose gold ‘12’ and 3 side faceted hour markers and original hands. Apertures display month and day, while the date is displayed by the blued center mounted hand along with blue outer-most date chapter. There are three subdials, for constant seconds, along with the chronograph’s 30 minute and 12 hour totalizers. 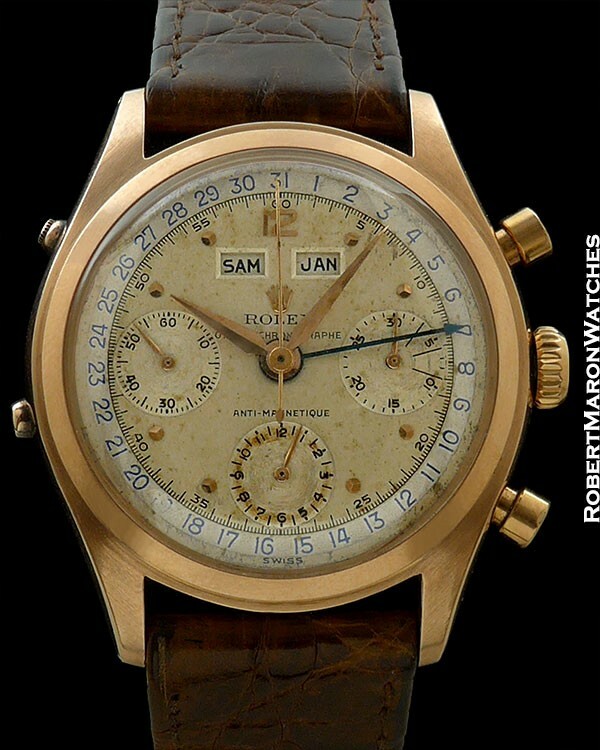 Dial is signed “ROLEX OYSTER CHRONOGRAPHE ANTI-MAGNETIQUE”. 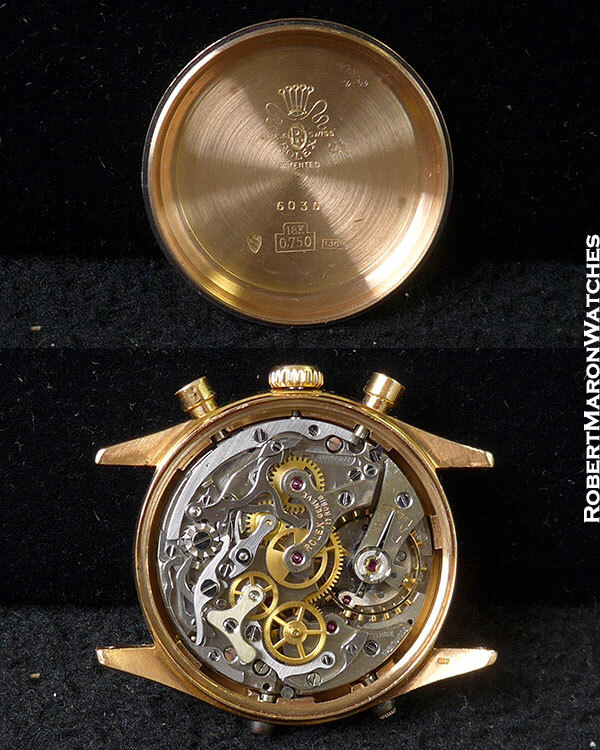 Original Valjoux Caliber 72C with 17 jewels with column wheel construction. Movement is clean and running. Vintage Rolex strap with original vintage 18k rose gold Rolex buckle. 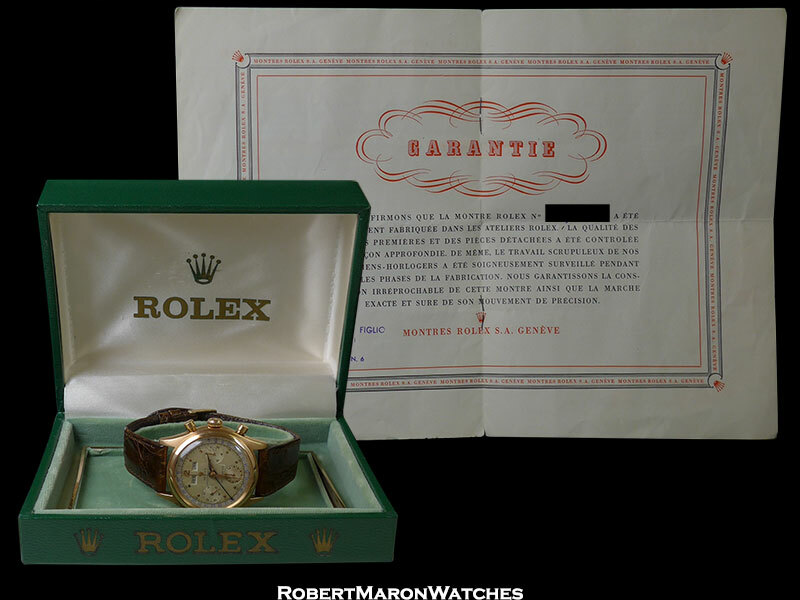 Watch is accompanied by original Rolex box and papers.